4 Bedroom Detached House For Sale in Redhill for Guide Price £850,000. A stunning Grade II listed 4 bedroom period home situated in a convenient position for Merstham village and mainline train station. The property dates back to the 17th century or earlier and was originally a farm house and then in later years became the local Tavern. 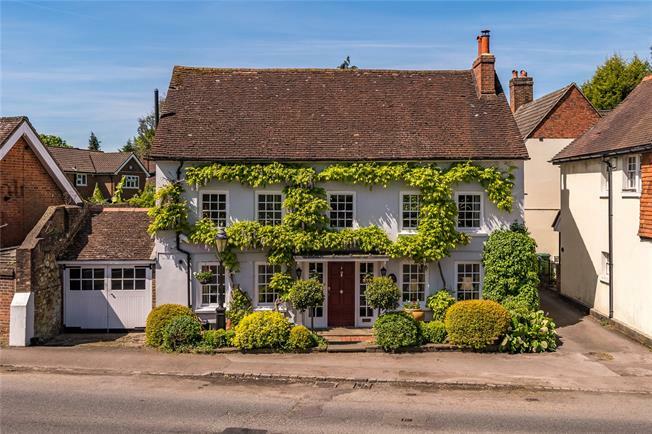 The property offers a wealth of character and history and enjoys a variety of period features including an attractive façade, lovely fireplaces and original exposed oak beams to the ceilings and walls in many rooms. The property also offers well-proportioned accommodation including good ceiling heights throughout. The property opens into a large open plan reception room with fireplace and an adjoining cloakroom. Across the hall is a charming sitting room with lovely brick fireplace and wood burning stove. To the rear of the property with double doors opening out onto the garden there is a good sized dining room. Also at the rear of the house is an appealing kitchen/breakfast room with a box-bay window and views onto the rear garden. To the first floor is the main double aspect bedroom with fitted wardrobes, a large shower room with dual wash hand basins and a further double bedroom overlooking the back garden. The second floor provides two further double bedrooms with the larger of the two incorporating fitted storage and there is an additional contemporary bathroom to this floor. The property is located on the High Street in the heart of the conservation area of the pretty village of old Merstham. It is perfectly located being a 4 minute walk to the railway station (0.1 miles) which has direct trains to London Victoria and London Bridge in 30 minutes, Gatwick Airport in 15 minutes and the M25 is less than 3 miles away. The village of Merstham has a range of specialist shops with a choice of public houses and restaurants. The larger towns of Redhill and Reigate are approximately 2 and 3 miles distant respectively. There is a superb choice of state and private schools in the local area including the Hawthorns, Reigate Grammar, Royal Alexander and Albert and for the sporting enthusiast there are golf courses, tennis clubs, and gyms as well as Merstham Cricket Club which is nearby. To the front of the property there are double doors to an open ended garage leading to the rear garden The west facing charming walled garden has a well, a large area of lawn, patio areas, barbecue area, many mature shrubs and fruit trees, a vegetable plot and a small period outbuilding comprising a workshop, storage room/ outside WC and log store.